Ivy was not written with the Four Seasons or Frankie Valli in mind. But it was put on the session with Denny’s song “Opus 17” (Don’t Worry ‘Bout Me) when Frankie asked Denny if he had a ballad Denny thought would be good for Frankie to record. The song was later also recorded by George Maharis, best known at that time for his starring role in the hit TV show “Route 66”. 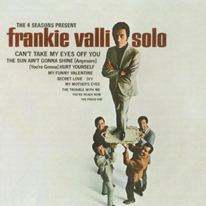 Frankie’s record is Denny’s favorite version and at the time it was recorded Denny felt it was a perfect song to display the other side of Frankie’s amazing talent as a singer. Denny: “It was great to work with Frankie on this kind of song as it was a departure from all the records we had worked on with that incredible “Four Seasons sound”. Approximately 9 years later Denny and Bob Crewe (producer of “Ivy” and one of Denny’s collaborators on “Let’s Hang On” and other songs) would again join forces to write “Swearin To God, one of the big hits of Frankie’s solo career. (Later yet, Frankie would also record Denny’s song “Native New Yorker” as a solo artist before Odyssey’s recording became a worldwide hit).